Out of all the Turret Defense games in the App Store, GoblinGun would have to be one of those up in that long list that you have to try out. Creator Andrey Ovsyannikov’s GoblinGun is a fun turret defense game for the iPhone & iPod touch filled with hours of game play, difficult levels, and unlocks able weapons. At first glance this app didn’t look like much. I mean the first level was long and with only three different turrets available. I was ready to toss this aside. I just didn’t want to waste my time on another simple, unoriginal game that felt low budget. Boy was I wrong. After playing for awhile it soon started to get more difficult. I soon started to get more attached to this game, and the feeling of a “keeper” was ignited. Now to the cons in the GoblinGun app. The first level that I played as I said earlier was what caused me to almost give up. With no sign of progression at all I thought this was endless. It would be great if they decided to add something that would show you where you are in the level. I played this at normal mode but the game soon went from easy to hard within two levels. To the newcomers or rusty players like myself, it can quickly bring your perfect score to a “game over”. All and all I would recommend GoblinGun. GoblinGun is definitely a game I will keep for a long time. Ever since I was playing StarCraft when I was 10, I’ve always loved mini games where you start out slow and slowly build up your god like team as in Golems. 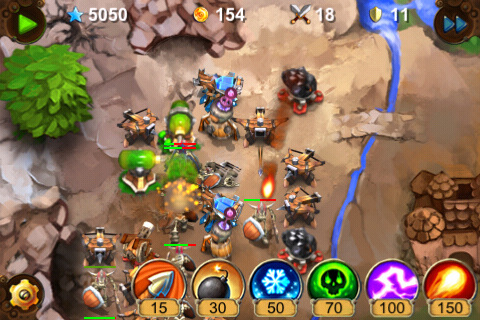 I haven’t reviewed that many turret games but comparing GoblinGun to TowerMadness, I would play this more. The graphics feel nicer, the weapons are more understandable, and you don’t need to pay additional money for more weapons. Unfortunately there isn’t a free version, but if what the description says is true, we can expect there to be constant updates to this game. You can find GoblinGun in the iTunes App Store for 99 cents. 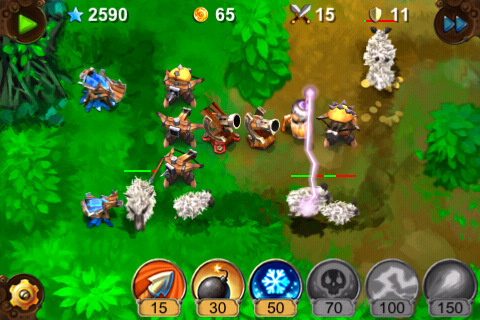 AppSafari review of GoblinGun was written by Vincent Tam on June 14th, 2011 and categorized under Action, App Store, Games, Resource Management, Strategy, Tower Defense. Page viewed 3793 times, 1 so far today. Need help on using these apps? Please read the Help Page.